Although this now marks the third time that I have covered Rockpile in this space, this entry is more about the venue than the band. 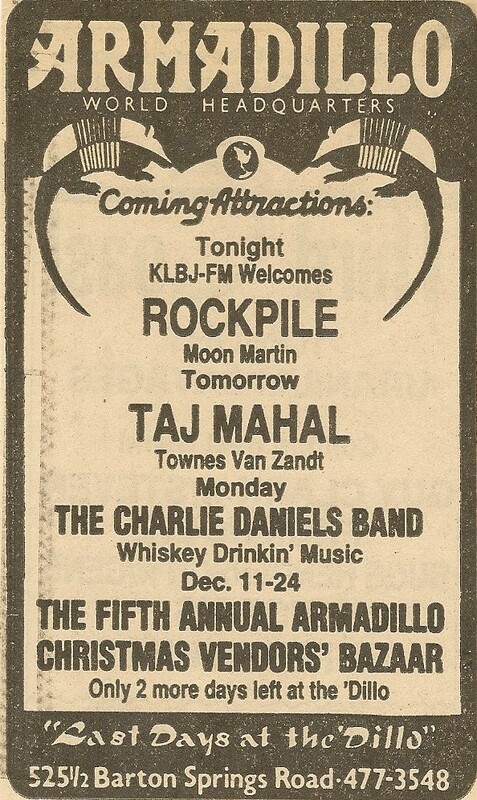 I moved to the Lone Star state in early 1980, just in time to catch three shows at Austin’s legendary Armadillo Word Headquarters in its final days. This famous venue had a ten-year run hosting shows by many of the great progressive country music artists as well as opening itself up to a diverse selection of rock acts. As far as rooms go, it was really nothing more than a large open indoor space in a converted old National Guard armory. It had a big dance floor area in front of a tall stage. Sadly, despite all of its acclaim, money ruled and it was torn down to make room for a high-rise office building as a part of Austin’s commercial development. My last visit to the ‘Dillo was just weeks before its curtain came down with an all night New Year’s Eve show by Asleep at the Wheel and Commander Cody. This was also the one and only time that I saw Rockpile billed under just the band name rather than with the name of either Dave Edmunds or Nick Lowe out in front. Turns out, this was their unexpected farewell tour behind the lone album (Seconds of Pleasure) they released as just Rockpile. Of course, they played their usual great set that seamlessly blended Edmunds’ country/rockabilly slant with Lowe’s knack for pop and power pop. My lasting memory from that night is seeing a tall slender short-haired Nick Lowe saluting the crowd from his position stage left on the bass. The opening act was the talented songwriter Moon Martin whose knack for writing a great pop tune let him slip comfortably into the new wave field. His set was a treat offering up his own recent hit “Rolene” in addition to two of his songs that were made popular by others: “Bad Case of Lovin’ You” (Robert Palmer) and “Cadillac Walk” (Mink DeVille). Moon currently falls into the “where are they now” category. I am sure if I moved there earlier, I would have spent much more time within the walls of the ‘Dillo. Glad that I at least got the chance.